Out of all the Famiclones that I own, I would have to say the MaxxPlay has the best build quality, by far. It may look like the run of the mill Famiclone packed into an N64 style controller, and it is, but there is a strange sense of quality behind it that pushes it further up the ladder than the others. I will be giving the MaxxPlay a good going over and explaining the pros and cons of this system, compared to the other plug n play Famiclones that I own. 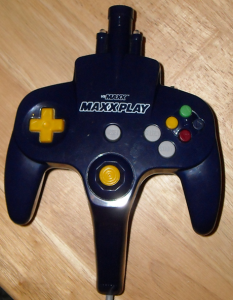 As soon as I first played the MaxxPlay, I could immediately feel how different it was from the Super Joy and Power Joy systems I own. The plastic is substantially more rigid, the d-pad (and working joystick, might I add) is more accurate and the buttons have a really nice springy response. The intro screen is even a well illustrated set of instructions on how to use the system, in case for some reason you couldn’t figure it out otherwise. 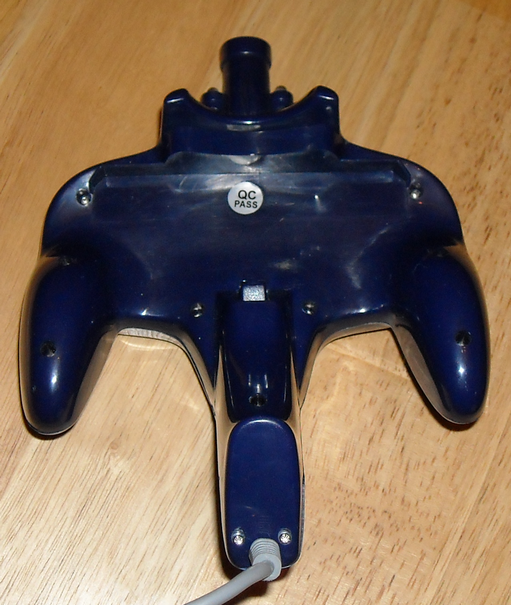 The basic design is much the same as many plug n play Famiclones, N64 controller styling, adjusted to suit the needs of the system dwelling within, with a Famicom 60 pin connector attached to the bottom and using the memory card slot as the battery pack receptacle. The integrated light gun is present as well, with added LEDs on either side (for added dramatic effect?). Player 2 plugs into the handle of player one, as well as the system has hardwired AV cables, both of which are just like the Power Joy. The main system functions well with 95 built-in games, but the 60 pin connector on the bottom is plagued by the same tight, uncomfortable placement as all other plug n play Famiclones. Although this time there isn’t enough space to make a good enough connection for most of my Famicom cartridges even work, oddly enough I’ve found by their poorly made nature pirate carts work slightly better. Even so, if you accidentally bump the cartridge you’re going to need to reset the system and try again. Box World — Box/Warehouse style puzzle game — Boxxle Clone? Gold Digger — Main Character resymbols Kirby, otherwise unknown. Mars Man — Binary Land hack. Cloud Fire — Twinbee hack. Even though the system feels good and performs solidly, with the aforementioned cartridge issue there is only one more shortcoming that drags the system down slightly. 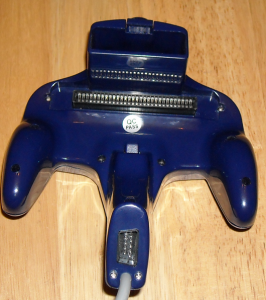 On both the Power Joy and Super Joy systems there is an option to use an AC adapter to power the system, when batteries fail and boy do batteries fail when they run low. The MaxxPlay, through its seemingly well planned design, does not afford the option to be powered by an AC adapter, strictly running on batteries. Player 2’s controller is essentially the same as the main system, obviously lacking the brain and any other functions that the main system would need. The battery pack area is instead a very cleverly designed stand, for some reason. Also lacking is any sign of a connector, although Player 2 does get their own integrated gun as well. Overall, with the 2 minor gripes that I have about the MaxxPlay, I wouldn’t suggest anyone avoiding this system. Although by definition the MaxxPlay is a Famiclone, I personally wouldn’t credit it as such since its pretty hard to get Famicom cartridges to work, more a portable system with built-in games. If you’re on the road, and have access to a TV to plug one into, I would say the MaxxPlay is a rugged enough system to play and enjoy to pass the time.